The California Department of Education (CDE) commissioned the Santa Cruz County Office of Education to develop a centralized repository of technology related resources and professional development opportunities for California's administrators. 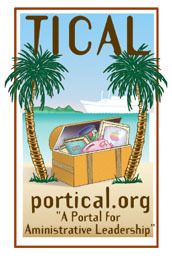 The Technology Information Center for Administrative Leadership (TICAL) and portical.org were born! Wild West Design was called in to develop a logo that would capture the spirit of the adventure of learning and the internet.